In 1986 young Bart Baele left the family house and wandered from farm to farm with only one idea in mind : to draw and paint. The following years were difficult but they left their mark on his style and his status as an artist; it took him a long time to be acknowledged as such by his friends and family as well as by professionals. 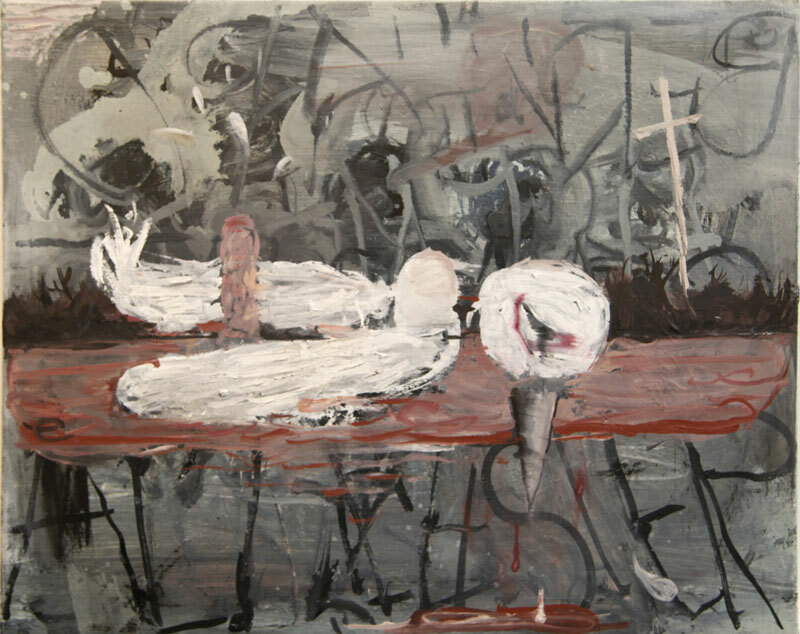 The Last Crow is the third solo exhibition of the artist at the galerie Polaris, following Le Flamand craquelé in January 2011 and Religion-lépreux-crapulé in 2012. According to the weather, Bart Baele works either in the kitchen or in the barn of his isolated East Flanders farm (Oost-Vlaanderen). The Last Crow emerged during this winter, whiteness and loneliness are the basis of this new series. One might think that the crow represents the personality of the artist like the mask for his fellow countryman James Ensor. Bart Baele’s recent works describe his torments and his vision of humanity where man tries to differentiate good and evil, pain and joy. It appears with much emotion and violence but also, if one watches thoroughly the details of the paintings, with humour. These strange and singular ( but remarkable ) paintings and drawings do not show the difficulty of living but rather the strength that every one must find to accept it. Bart Baele’s emotion is primitive and crude as we seldom see.